Life continues to happen. The good, the bad and the ugly. Cancer waits for no one, including a bike race. Cancer spares no one, including my best companion Jack Denny, the labradoodle. Meet Jack Denny. He wears a tshirt because on this day he has five incisions on his body where the cancer tumor or suspicious cancer bumps were removed last week. Yes, he is really that big! 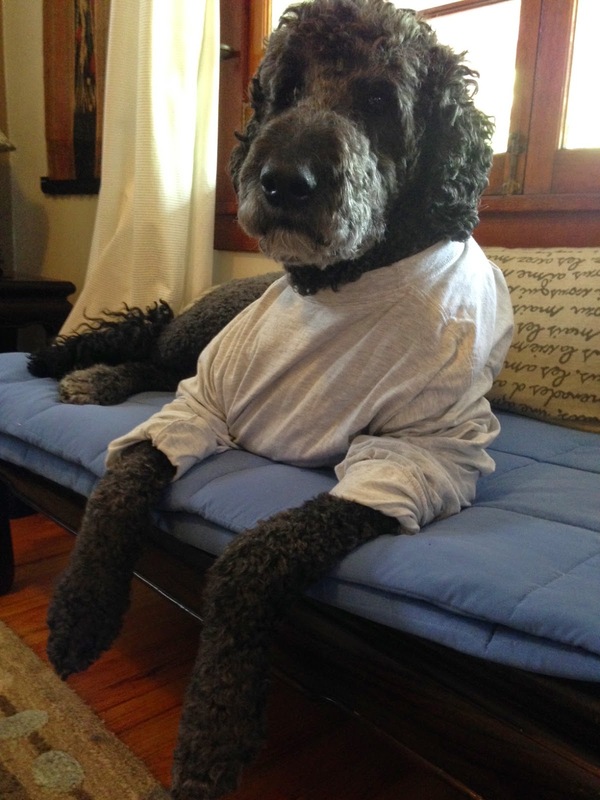 Jack Denny is a labradoodle with some whacky genetic propensity toward "lab bumps". Sometimes they are harmless bumps, sometimes they are harmful. Last week I had a huge scare when one of Jack's bumps was found to be Mast Cell Cancer. This is the second time we've gotten the dreaded cancer diagnosis. This time, like the first time, the pathology report showed that the index was low and no more tests were needed at this time. We sit tight and wait. Some dogs and dog owners aren't so fortunate. I am happy and lucky to have my companion. I had a vacation planned for this week to chase the USA Pro Challenge around Colorado. But a dog with five incisions who wears tshirts needs some extra care, so Jack is coming to Aspen for the weekend with me. If you happen to see a very large black doodle in a USA Pro Challenge tshirt walking down the street in Aspen or Snowmass, come up and say hi to Jack and Karen. I won't be able to attend as much of the race as I had planned, but I will be watching it everyday and writing what I can. Luckily I had completed most of my pre-race travel/fan guides and have templates set up to make the other stages easier to report results. I look forward to spending a couple days in Aspen and then be back at the race for more the following weekend. My priorities sort of changed, I hope you understand.